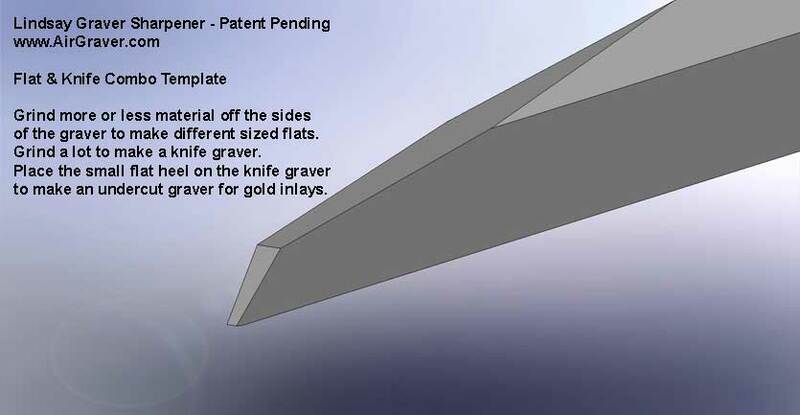 I am looking for flat gravers approximately 20 thousands wide. Do you sell them? Hi Chuck, That would be the flat/knife template. You can make a flat all the way down to pretty much nil with it, so that the width is just governed by your heel size. I have the flat/knife template bench stones and drill press 220 lap. My first set of templates came with basic instructions and a sharpened graver. Thus I had an idea what it was suppose to look like and an idea of how to get there. I'm not sure how to get started with the flat template. I am assuming with the small green four sided template. What's next. The bottom? then the sides? how much do I take off? Any help would be appreciated. I'm sure it will be obvious once I understand better. Thanks Steve- I think I am getting it figured out. I look forward to giving it a test run when my Classic arrives. Wellll, I don't have it figured out. The Video was great for finishing off the graver but there are a few steps missing. Or, better said, I think the graver in the video had been shaped ahead of time and that's where I'm hitting a wall. Sides with small template, no problem. Once that is done and I inspect the graver tip head on and it is narrower at the top than the bottom, like the template. The finished gravers are wider at the top than then at the bottom, not like the template. The top and bottom are untouched at this point. So is the top the top even though it is narrower than the bottom? Finally, when does the graver get the 45ish degree angle from the side view? It won't happen with the top of the small template. We can put the 45 on the face any time during or even before the small template. That might help you understand or see what is going on. In other words, you can switch back and forth between the two templates as shaping as needed you to see the point forming. After the face is ground you can go back to the small template and continue shaping. PS.. Looking at the photo it looks like it is coming. For now go ahead and put the 45 face on and then go back to the small template. After you see it with the face, check that you have the width of the flat where you want and then grind the bottom with the small template until the V part is flat.